With very few places offering high quality hair extensions in Camden, our specially trained hair extension artist, who has over 15 years’ experience, encouraged us to introduce a service which offers 100% luxury human hair extensions. What makes our Camden hair extensions so competitive is the combination of our beautician’s expert skill and dedication to the highest quality products. With high quality hair and a professional service being of paramount importance, our hair extension artist is very select about appointments and usually reserves very few slots per week. Instead, preferring to spend 3-5 hours with each client so they get the high standard and luxury service they deserve. 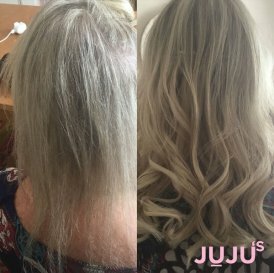 Visit JUJU’s for one of the best hair extensions in London! Our beauticians spend a lot of time helping clients with hair extensions, it is a very popular request in our salon! You will find us one of the best places in London to extend the length of your hair! Because our artist refuses to use poor quality materials and substandard instruments, every item used is ethically sourced and guaranteed to last. You get nothing short of quality from the minute you walk into the salon, until the moment you are ready to remove the extensions. In short, your hair is in safe, experienced hands at JUJU’s. During your free 15 minute consultation, you’ll be asked a number of questions. Our hair extension artist will talk you through the different options available and provide an exact colour match for your natural hair. We have a huge selection of extensions to choose from, whether it’s wavy hair, straight or a particular length and shade. Our luxury human hair can also be examined in its raw state, so you can rest assured that you are getting the highest quality hair extensions. During your consultation, you will also discuss maintenance, aftercare and follow up appointments. With proper care, your extensions can last up to a year and will not start to shed or matt. This process is part of what makes our Camden hair extensions the best available locally. For our clients, JUJU’s beauty salon is often called a home from home. The relaxing and homely environment and friendly staff offer an unrivalled service in Camden. However, for the same price as you pay in the salon, our professional hair extension service can be undertaken in the comfort of your own home. With a minimum fee for travel costs, our hair extension specialist will travel to your home and offer the same premium client experience that you enjoy whenever you visit the salon. You can view JUJU’s hair extension prices here. Whether you want a complete change of look, or simply want to add volume or length. You know that you’re in safe hands with JUJU’s. To book a free consultation, contact the salon or call 0207 2678787 and speak to our helpful receptionist. We are a leading provider of hair extension services in Camden. Come to our beauty salon and walk away with the most luxurious and beautiful hair!